Portbeg Holiday Homes is a group of 14 houses located on the fringe of Bundoran, Ireland’s Surf Capital. They are are situated one minutes walk from the Atlantic coast and 8 minutes walk from the restaurants, pubs, and visitor attractions. The location is also an ideal base for surfing, golfing, horse riding, deep sea angling, cycling and walking holidays. Each house has four bedrooms and is furnished to the highest standards with an array of mod cons including colour TV, video, microwave, dishwasher, fridge-freezer, washing machine and dryer. All houses are centrally heated with an open fireplace for those colder evenings. They have open plan gardens. Wifi is available in the office which has a lounge area for customer use. Detached houses (sleeps 8): The bedroom layout is 3 doubles (2 are ensuite) and 1 twin and a main bathroom. 2 bedrooms are upstairs and 2 bedrooms are downstairs. The detached houses are a higher standard than the semi-detached houses. Located in a secure, quiet location, Donegal Bay Holiday Homes are ideally suited to surfers, families or to people just wanting to ‘get away from it all’. Donegal Adventure Centre is located in Bundoran, and offers a range of activities from 8 years to adult, including surf lessons, canoeing & kayaking and snorkling. There is a daily holiday camp during all school breaks offering fully supervised activities for children aged 8-18 years. Teen surf camp is also available for young surfers. Adults are welcome to try a range of watersports and land activities. The centre provides and hires wetsuits, surfboards and body boards. We are open every day from 9.30am until dark. We are on Bayview avenue, opposite GAA football pitch.Also ideal for childrens tours, birthday parties, adult leisure and team building breaks. 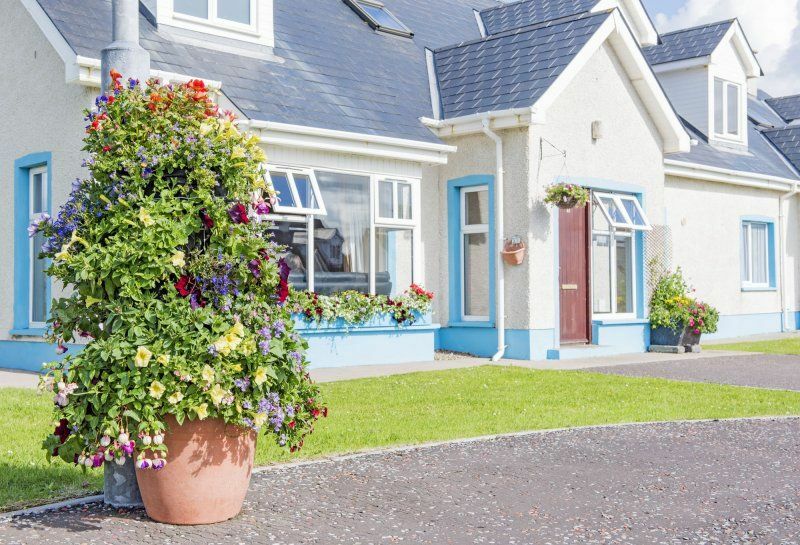 Family orientated attraction, seafront location, within walking distance from all amentes in Bundoran. New bumper cars and large selection of adult and children's rides. Trampolines and bouncy castles. Funfair games where you can win super prizes. Candy floss, ice cream and gift shop. Large amusement arcade. Donkey rides and much more. Height and age restrictions may apply on certain rides. Bundoran Star is a very high specification vessel fitted with all the latest safety, fishing and navigation equipment. Her facilities & equipment include: Colour radar, Colour fish finder, Colour sounder, colour plotter, GPS, VHF DSC radio, VHF radio, cooking facilities, Toilet. Full safety equipment, EPIRB, SART, 16 person Life raft and life Jackets. Bundoran Golf Club dates back to 1894 and is a Championship 18 hole Golf Course. Presenting a challenging par 70, the course sweeps along the coastline with a mixture of dunes and undulating terrain.Within a 35 minute drive, you have a choice of other superb links courses-Murvagh, Rosses Point and Strandhill. The equestrian centre enjoys an enviable location on magnificent Tullan Strand. Eminently qualified riding instructors provide both personal and attentive tuition for all age groups and levels of experience. The centre provides week long trail rides as well as day and week long pony camps. 8 lanes of fully computerised bowling. Open 7 days. Wheelchair friendly. Group and school rates available. All the latest videos and games. Hire one of our mountain bikes and explore Bundoran and beyond. We offer half day, daily, weekend and weekly rates. Delivery service available. Childrens bikes available on request. Local scenic walks include "Rougey", a delightful walk which follows a route along the headland from Bundoran Bridge to Tullan Strand. Along the walk it passes the "Fairy Bridges" and the "Wishing Chair". At the West End you can enjoy the Cliff Walk. Starting from Sheen Avenue, this walk follows the coastline along to Tullaghan. Donegal Bay is the ideal base for your 'surf break.' Described in the bible of surfing; The Stormrider Guide' as ''the surfer's paradise'' or the ''cold water Eden'', the immediate environs offer a wealth of breaks, both reef and beach. This combination provides the ideal opportunity for everyone to enjoy one of our most natural assets-from the simple beginner to the top professional. Bundoran has also been the proud host to various European Championships and the 2001 Quiksilver World Masters Championships. And, if you're worried by the cold, Donegal Bay benefits from the warm waters of the Gulf Stream, churning their way up from the Med, making it one of the warmer spots in Ireland. Waterworld is an award winning Aqua Adventure playground for children of all ages. Enjoy two leisure pools . A slide pool with three slides - Scute Shute, Traffic Light Slide and Tornado Flume plus the Whizzer Slide, the fastest waterslide in Ireland and over 65m long. A wave pool with 5 wave patterns, 2 speed rapids plus lots of children's slides and features. Fantastic family fun for all! From Sligo, at the roundabout coming into Bundoran, go straight ahead towards the town, approx 1 to 2 KM on the left, there are signs for Portbeg / Donegal Bay Holiday Homes, the office is Number 19. From Donegal / Belleek, when you enter Bundoran, drive down through the town towards Sligo. After leaving the town, Donegal Bay Holiday homes are on the right. Wine and Christmas Hamper in you accommodation for your arrival.